Qualcomm today fully revealed the Snapdragon 855 mobile platform, its top-tier system-on-a-chip heading into 2019. Qualcomm focus on a number of pillars when developing this SoC, including performance, connectivity, AI, camera, and entertainment. The 855 is based on the Kryo 485 CPU, which consists of one high-power core at 2.85 GHz, three performance cores at 2.42 GHz, and four efficiency cores at 1.8 GHz. The Kryo 485 relies on Qualcomm's 7nm process for efficiency. It is paired with the Areno 640 GPU. Together, these deliver a 45% improvement in performance and 20% faster graphics. For connectivity, the Snapdragon 855 relies on the Snapdragon X50 modem for future 5G networks (sub-6GHz and mmWave) and the Snapdragon X24 Cat 20 LTE modem for 4G support. It can achieve LTE speeds of 1.2 Gbps given the right network environment. Qualcomm says these will allow 855-based devices to support multiplayer VR gaming, shopping with AR, and real-time video collaboration. The 855 is WiFi 6 ready, supports 60 GHz WiFi (mmWave WiFi), Bluetooth 5.0, and dual-frequency GNSS. The Bluetooth adopts Qualcomm's TrueWireless Stereo Plus to ensure that fully wireless headphones have the lowest possible latency with the strongest possible connection. It also includes aptX, aptX HD, and aptX Adaptive for clearer sound. The Snapdragon 855's fourth-generation artificial intelligence features are powered by the Kryo 485 CPU, Adreno 640 GPU, and Hexagon 690 Processor, which has double the vector processing compared to the Snapdragon 845. The AI improves neural processing, and will boost the performance of device-based assistants thanks to AI-assistant echo cancellation and noise suppression. The 855's camera features are powered by the Spectra 380 Image Signal Processor. It can support two 22-megapixel cameras or a single 48-megapixel camera. It handles object detection and tracking, stereo depth processing (for portraits), 480fps slow motion capture at 720p. The Spectra 380 supports HDR video capture up to 4K at 60 frames per second with 10-bit color and high color gamut. It can handle hardware-based EIS and capture RAW and HEIF images. For entertainment, the 855 relies on the Adreno 640 GPU to take HDR gaming with 10-bit color, physically-based rendering, hardware-accelerated H.265 an VP9 decoders, and HDR playback support for HDR10+, HDR10, and Dolby Vision. The 855 can handle 8K virtual reality playback at 120 frames per second. It supports the modern APIs that developers use to create modern game and video content, such as Vulkan 1.1, OpenGL ES 3.2, and OpenCL 2.0 FP. The Adreno 640 can power a 4K HDR display, or up to two 4K HDR external displays. The 855 also adds Qualcomm's biometric authentication suite, including fingerprint, iris, voice, and face authentication. It supports Qualcomm's new 3D Sonic Sensor, which uses sonic waves to read a fingerprint through glass. Last, the chip supports Quick Charge 4+ for faster power-ups. 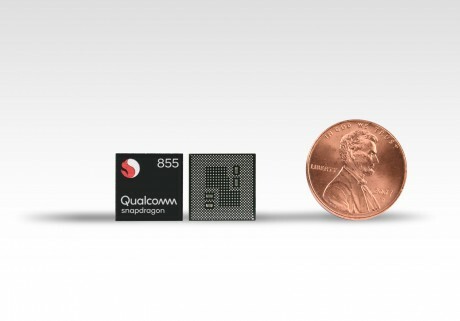 Qualcomm expects to see the Snapdragon 855 mobile platform in mobile devices early next year. Qualcomm today announced the Snapdragon 710, the first system-on-a-chip in its 700 series mobile platform. The 710 finds space between the Snapdragon 600 series and Snapdragon 800 series for devices that need to balance performance and cost.